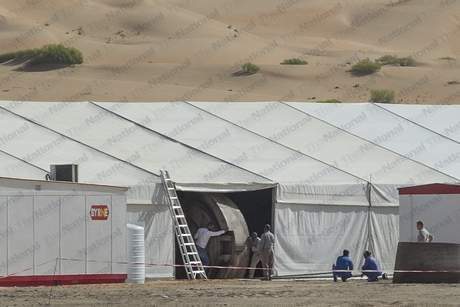 First Star Wars: Episode VII set photo from Abu Dhabi? The National photographer Mona Al Marzooqi has captured what are believed to be the first images of Star Wars: Episode VII set deep in the Abu Dhabi desert. It isn’t the most exciting photo but it is more fun than naming off people not in the film. 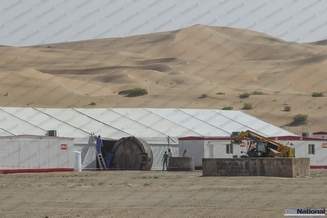 The photos, taken on Tuesday morning in the dunes near Qasr Al Sarab resort, reveal a large encampment of tents with four to five workers moving around what appear to be parts of a filmset. It is one piece of equipment in particular, however, that is the most suggestive: a giant, round, grey disc, which bears a striking resemblance to parts of an escape pod on which C3P0 and R2D2 crash-landed on Tatooine in the original, 1977, Star Wars: A New Hope film. That is interesting. It doesn’t really sound like a part of the escape pod, unless they mean the lid? Hmmm. No, too big. As Johnamarie said, it is more likely to be an AT-AT than an escape pod. “I live around here, it’s totally my home area and I’m sure if anything as big as that was going on I’d know about it,” said an Emirati farmer. According to sources within the local film industry, crew members have already been hired for the Abu Dhabi leg of the secret production. Pretty cool and fun story either way. We’ll see soon enough!